I thought I was doing just fine with my current bike light setup—yes, my front light is secured with electrical tape and it needs to be encouraged to turn on with a good smack or two. And yes, rear lights mysteriously disappear en route between my apartment and the office on a regular basis. Ok, who am I kidding, I need a new bike light system. Luckily for me, I’ve been tasked with testing out a couple different options. First up, Dorcy Hawkeye lights. Dorcy doesn’t mess around with lights. The company’s products range from personal flashlights and headlamps to heavy duty spotlights and signal wands (for directing traffic). The Dorcy Hawkeye LED bike lights promise to pack a punch with the front light boasting 200 lumens, guaranteeing to light the path 200 meters down the road and to be seen from even further away—same goes for the rear light. 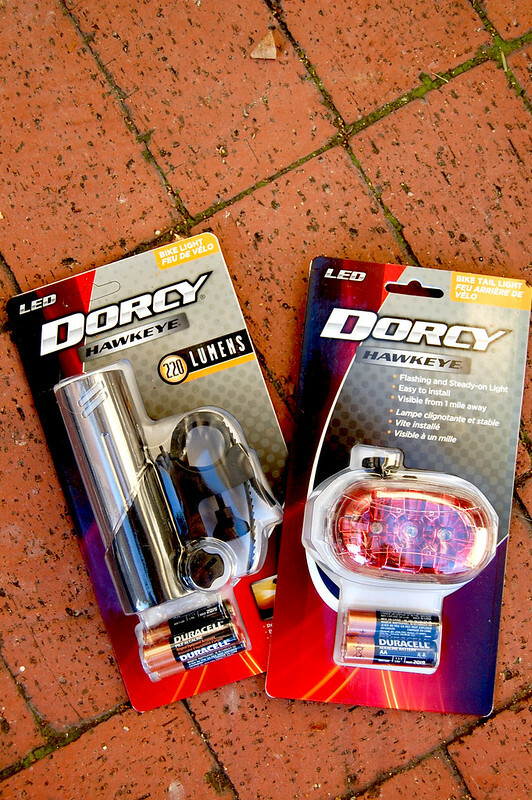 The Dorcy LED bike light is not a dainty addition at nearly half a pound including three AA batteries. Even with the option of using rechargeable batteries, I’m not a big fan of battery powered devices, if only because I never seem to have extra batteries when I need them most. 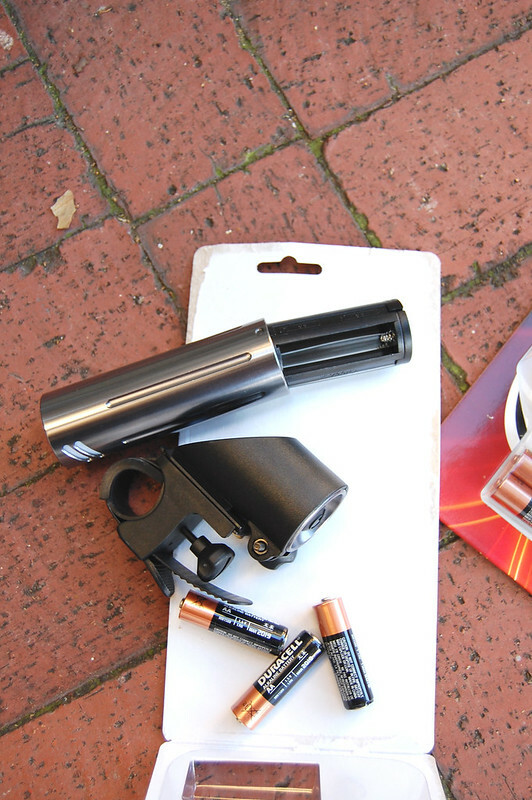 The battery cartridge has a satisfying barrel-like design, reminiscent of a revolver’s bullet chamber. Not sure why I like that so much, but I do. Though it doesn’t help the overall weight, which seems a bit hefty to me. 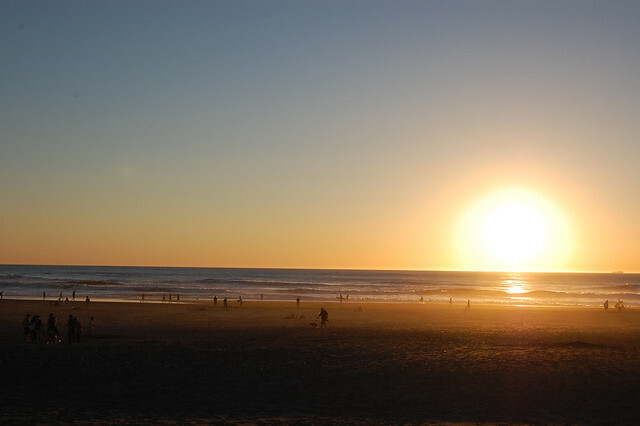 The light itself is much larger than most, nearly five inches long. But this is no ordinary bicycle light, my friends. 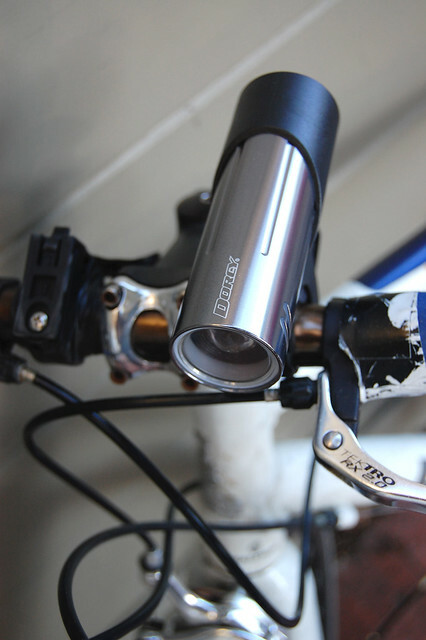 Thanks to a patented quick release feature, the “durable aerospace-grade aluminum alloy, corrosion resistant” light chamber pops out of the bike clamp, transforming into a handheld flashlight. Snazzy. With the rubber-padded bracket attachment, the light stayed secured to my handle bars with no obnoxious rattling (which is just the worst) or movement up and down. 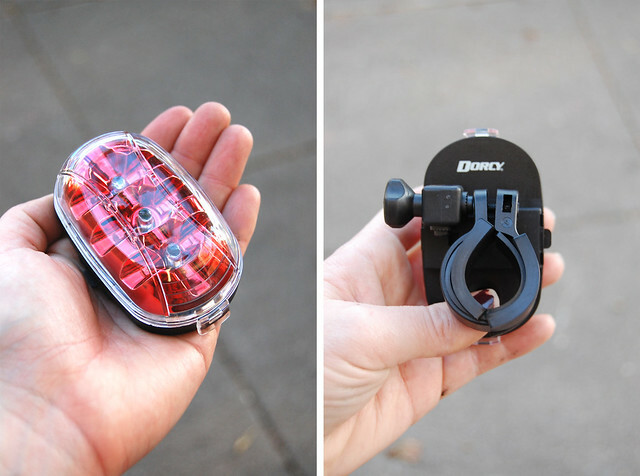 Dorcy claims that the bracket will fit any bike on the North American market, so I’m guessing this light will fit just as securely on nearly any bike. 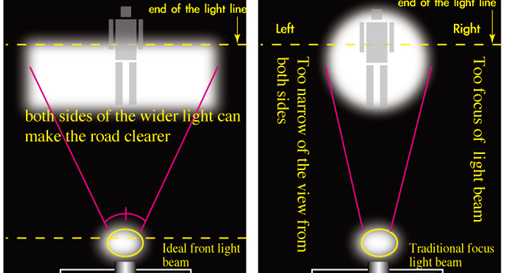 The Dorcy Hawkeye features a wide-angle, rectangular light beam rather than a traditional focused beam, which helps to illuminate the entire road ahead while limiting (unnecessary) spread of light upwards. They also claim that this feature “will not blind pedestrians.” I tested this assertion by making my friend, Sarah stand still while I rode toward her, light blaring. Sarah still seemed to cringe way from the light, but once I rode closer, the beam did indeed remain below her eyes. On to the rear light: the Dorcy Hawkeye Tail Light features three super high brightness LEDs that can be seen from 200 meters away. 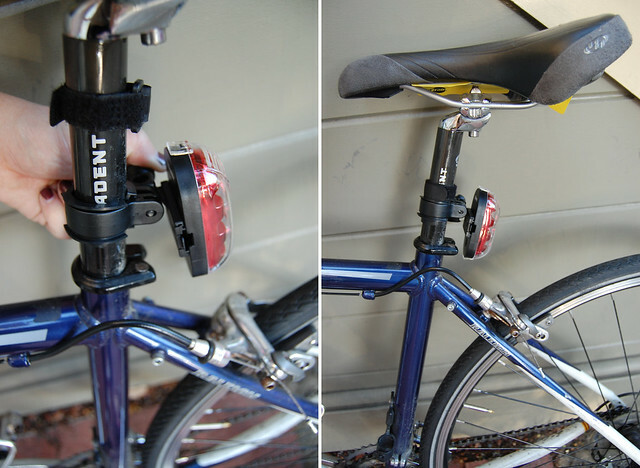 Like the front light, the rear light’s mounting clamp is tool-free and adjusts easily to fit snuggly on any 24 – 32 mm diameter seat post. Plus, the patented bracket adjusts for a horizontal or vertical orientation. 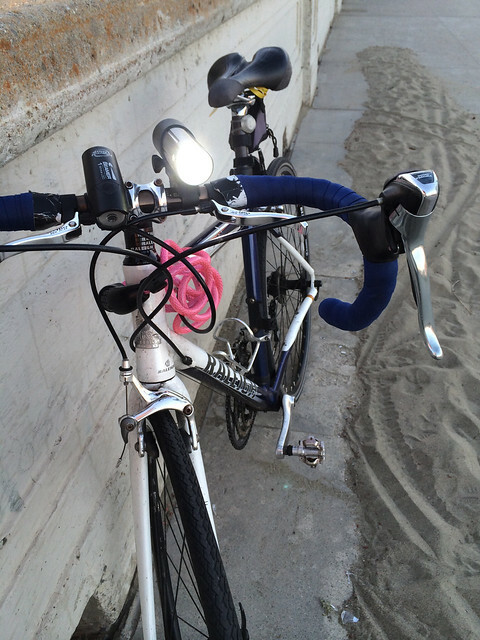 For my first ride with these lights, I ventured out through Golden Gate Park to catch the sunset and make sure that it was good and dark for my return ride. Both the rear and front lights have just two setting: steady beam and flashing. As promised, I felt like my lights could be seen from blocks and blocks away. Seriously, I was lighting up reflective street signs as far as I could see (maybe five or six blocks). Also, the front light has two slits on either side, allowing light to filter out and illuminate the area right and left of the rider. While this is a bonus for visibility, I found it to be distracting with the light shining in my eyes. For everyday commuting, the front light is a bit large and hefty for my tastes; on the other hand, I would definitely choose the Dorcy Hawkeye for my pre-sunrise rides through poorly lit backroads. Not only would I be well visible to traffic, but my path would also be lit clear as day. 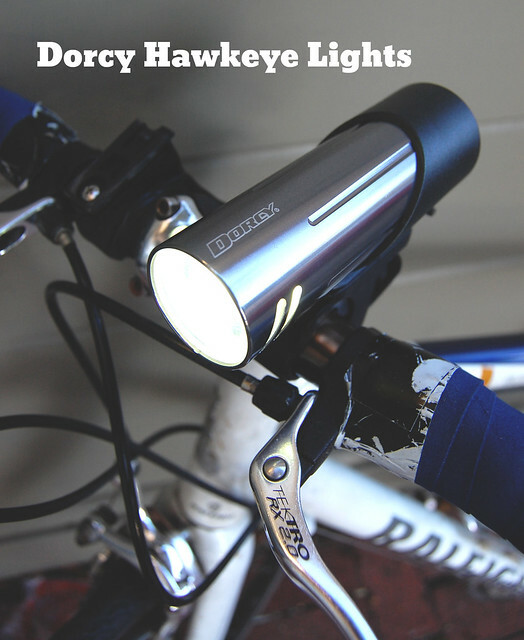 The Dorcy Hawkeye LED Personal Light front bike light retails for $55.00 and can be purchased directly from Dorcy.com—same goes for the LED Bicycle Tail Light, which retails for about $13.99.